The NEAR-Shoemaker probe was launched on 17 February1996 by a Delta-2 rocket from Cape Canaveral in the direction of Eros. It was to meet the asteroid in December 1998 after an incredible journey. First the small probe flew over Mathilda (in June 1997) at a distance of 1200 km. The asteroid revealed its size of 50 x 53 x 57 km, and the NEAR-Shoemaker instruments transmitted vital data on its composition, its magnetic field and its mass. After this rendezvous 205 million kilometres from Earth, the probe changed trajectory and lowered its perihelion to fly over our planet on 22 January 1997, 450 km above the surface. This manoeuvre allowed it to modify the inclination of its orbit and to head off at high speed towards Eros. Unfortunately, on 20 December 1998, the on-board computer put the probe in safe mode after a software problem, and this caused the premature stoppage of the engine and a 24-hour break in communications. But this was the precise time when NEAR should have braked to stabilise around Eros. Because of the temporary breakdown, the probe flew over Eros (at a distance of 3827 km) at too high a speed to be captured by the weak gravitational field of the rocky body. The technicians then took the decision to give Near-Shoemaker a series of extra thrusts, causing it to make one more orbit of the Sun, after which it could attempt a new rendezvous with its target. 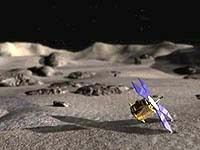 Finally, on 14 February 2000, the little NASA probe went into orbit around the asteroid for a one-year mission. This mission ended in glory with a landing on the surface of Eros on 12 February 2001. NEAR-Shoemaker landed on Eros on 12 February 2001.